Some years ago a report was published that ranked countries by the level of penetration of broadband data services. You can find the current version of that report at the OECD web site. The IPv6 Country Deployment – An interactive map of IPv6 deployment and number resource distributions by country. (Source: APNIC Labs)This ranking of national economies had an electrifying impact on this industry and upon public policies for broadband infrastructure in many countries. Perhaps this happened because there were some real surprises lurking in the numbers at the time. South Korea featured at the top end of the list (and still does if you equate broadband with fibre-based access services), while other countries which supposedly had an advanced domestic infrastructure for telecommunications services had surprisingly low broadband penetration rates. This caused a wealth of policy debates in many national regimes. Some countries, such as Australia, used their relatively poor ranking as part of the justification to the voters for a truly impressive public investment in a national fibre access network that would deliver very high speed data services to almost every residence in the continent. Other countries used the figures to justify widespread changes in the industry structure around the last mile copper loop, and opened up the DSL to vibrant competition, with consequent expansion of the DSL broadband service infrastructure (as happened in the United Kingdom, for example). Regardless of the form of policy response in each country, this ranking of countries by such a simple metric as broadband penetration had a transformational impact on many national policies in this area, with its own impact on the growth of the broadband market and the consequent growth of ever-richer digital service environments. A highly capable, highly efficient domestic telecommunications infrastructure is a well recognised enabling factor for further economic growth, as the OECD has been telling us for many years. But of course it's not all roses as we peer into the immediate future. While the growth figures of the Internet have been truly impressive in recent years, the downside is that the entirety of this growth is in IPv4 — a protocol that has unfortunately run out of addresses! Much has been written about the exhaustion of IPv4 and the pressing need for this industry to adopt IPv6, and no doubt much more will be written about this. And of course much will also be written about the risks if we get this transition wrong. If we don't manage this carefully we will surely witness the Internet stutter and fall apart on the back of a proliferation of idiosyncratic network middleware, perverse application gateways and other forms of ad hoc network intermediation devices that attempt to leap over the gap of a broken end-to-end network architecture. Lots of little Internets does not necessarily make one large Internet if we all start to use the same address pool in every little Internet. The state of the IPv6 transition is a critical item in today's public policy agenda for the Internet. Possibly even the single most important topic for today. Without a coherent address infrastructure those broadband deployments are of far lesser utility and far less valuable. Without a coherent address infrastructure all those new global top level domain names will be of far less value. Without the prospect of a single coherent capable and efficient Internet almost all the other topics around the state of telecommunications infrastructure and services will inevitably wane into petty squabbles and finger pointing about who allowed such a disaster to happen and why. If we manage to break this IPv6 transition we will inevitably break the Internet. Perhaps a useful question to ask is: "How can we place this topic in a position of prominence in the public policy agenda at a national level?" It's been possible to bring the Internet itself to prominence within national and international policy debates, and it's been possible to highlight such issues as the state of broadband infrastructure, content distribution, service delivery quality and Internet service costs. But that's not been the case with the state of the IPv6 transition. What have they managed to do that we're missing within the IPv6 transition? This is not a topic that is easy to highlight at a policy level: There are many aspects of this topic that are highly technical, there are many diverse views on the way to tackle this issue, and some significant levels of disagreement within the industry as to where and how to start. It seems like we keep on encountering chicken and egg scenarios everywhere we look, where one industry sector claims that it would get moving with the deployment of IPv6 services if only that other sector over there did something first. For example, access providers still claim that they would move with more speed if there was more IPv6 content, while the content providers claim that without IPv6-active customers there is little point in setting up IPv6-enabled services, and on and on and on. We've now had a couple of IPv6 events, with "IPv6 Day" in 2011 and "IPv6 Launch" in early June of 2012. These were efforts to try and orchestrate a larger common momentum behind this transition. But in 2011 after a burst of activity just prior to the day, the rest of the year saw the activity level wane. This year was a little more positive in terms of its effects and we have seen some pronounced shifts in the use of IPv6 in some countries, notably in China and the United States. But more must be done here all over the world. So, how can we motivate IPv6 as a subject of discourse at the level of national and international policy debates? Perhaps if we took a leaf from the broadband infrastructure book, and started ranking countries using a metric of the per cent of their user populations that are connected with IPv6 and have a capability to use it. Maybe this metric would act as a clear indicator that some countries are indeed managing this transition very well, while others are, well to put it bluntly, lagging far behind. "What proportion of the Internet's users are capable of using IPv6 when offered a choice of protocols?" Or, in other words if the true endpoint of this transition is 100% of the Internet's users actually using IPv6, how far along that path are we? What we found is that there is a very simple way of silently and quickly testing users' IPv6 capabilities within the conventional web browser function. We started by measuring users' IPv6 capabilities when they visited certain web sites. The test was silent, non disruptive and very lightweight. The test took an exchange of some 30 IP packets, each of which were minimally-sized packets. We set up the test as one that was lightweight, simple and silent. But unfortunately we were not really measuring the Internet — we were measuring the capabilities of visitors to certain web pages. We had the testing technique, but the next problem was the methodology of the test rig. How do you measure the entire Internet? Obviously getting each and every user to perform a IPv6 test once a day would be wonderful, but at APNIC we just don't have a means of doing this. We rephrased the question somewhat - how can we reach out and test a reasonably large random sample of users from across the entire Internet each and every day? This task has been just within our capabilities, and with the generous assistance and support of Google, the RIPE NCC, Internet Software Consortium and the Internet Society, we've managed to set up an IPv6 deployment measurement environment that tests a randomly selected set of some 1 million users per day by posing to their web browser the same simple IPv6 capability test. That's a lot of users, and they truly are spread out all over the Internet. Is there a way to break down this Internet-wide number on a country-by country basis? Again the answer is "yes," as the IP addresses used by the end users can be geolocated to a level of countries very efficiently. It is now possible to look at the state of IPv6 deployment on a country-by-country basis. And the answers are surprising. Perhaps as surprising as the early broadband metrics. Who is leading the IPv6 deployment effort? Japan? China? Slovenia? Sweden? Yes, they are all in the leading set of countries, but none of them are out in front. Who is in front? Relatively speaking, today it's Romania. Some 7.4% of that country's 8.6 million users are IPv6 capable today. That's impressive! Next is France, with some 4.0% of that countries 50 million users enabled with IPv6. In France it amy well be indicative of the efforts of a single access provider, Free, who operates in the French ISP market with a highly efficient business model that has proved popular with consumers that includes IPv6 capability bundled into their product sets. China is also up there with 1.1% of its estimated 516 million users enabled with IPv6. On absolute terms China has an estimated 5 million IPv6-enabled users, with the next largest country being the US with some 2.5 million IPv6-enabled users. The other end of the list also contains some surprises, with the United Kingdom, who has an extremely good record in broadband deployment, showing an IPv6 deployment level of some 0.08% of their 52 million Internet users, grouped with New Zealand (0.07%), Kazakhstan (0.07%) and South Korea (0.04%). And yes, Norway (0.52%) is truly well ahead of both Sweden (0.16%) and Denmark (0.09%) according to this form of national rankings! The other somewhat surprising metric is that the overall Internet metric of IPv6 use is still well below 1%. Given that the supplies of available IPv4 addresses have run dry in the Asia Pacific, are about to run dry in July this year in Europe and the Middle East, and similarly we anticipate a run-down date of early in 2013 for North America, our overall state of preparedness to get this IPv6 transition underway is not looking good. Getting this transition started is not enough — we need put it on track to be completed within the next couple of years. So perhaps the best message I can offer to Canada (0.06%), Brazil (0.03%) and Italy (0.01%) is to look very carefully at programs in Slovenia (0.76%), Switzerland (0.93%), the US (1.01%), China (1.06%), Japan(1.64%), France (3.90%) and Romania (7.28%) and get this transition moving! National pride is at stake! • The report on IPv6 deployment levels on a country-by country basis is generated each day and published at http://labs.apnic.net/dists/v6dcc.html. • A complete report of V6 deployment and number resource distributions by country is also published at http://labs.apnic.net/dists. 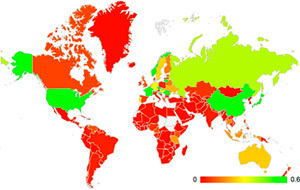 • An interactive map of this data can be found at http://labs.apnic.net.